And it’s back! Season 22 of The Bachelor begins just one week from today! Yep, time to schedule your watch party, start corralling your friends and fill out your Bachelor Brackets! 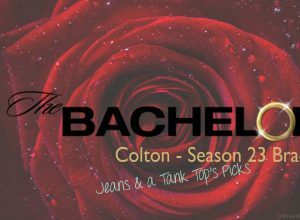 The Official* Jeans & a Tank Top Season 22 Bachelor Bracket! * Official through Jeans & a Tank Top, only, and in no way recognized or part of the ABC network. And THIS season, for the first time, I’m releasing the Official* Jeans & a Tank Top Season 22 Bachelor Women Cheat Sheet! I’d had requests in the past and finally got in gear and made it happen. This should be particularly helpful in a season of four Laurens. 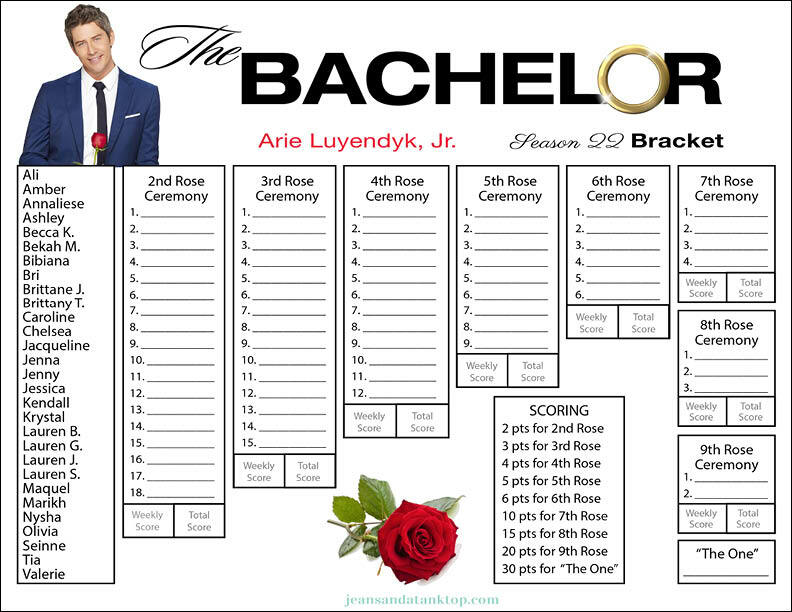 This Bachelor Bracket begins AFTER the first rose ceremony. Trying to predict the outcome PRIOR to the first episode would be like filling out your March Madness bracket without knowing how the teams had been playing all season long. This way you get to see a little bit of each contender and make slightly more educated picks. You do not need to make ANY selections PRIOR TO, or DURING, the first episode of The Bachelorette. Watch the first episode on Monday, January 1, 2018, at 8pm/7pm central. During the first rose ceremony, cross out the names of the women who have been sent home. 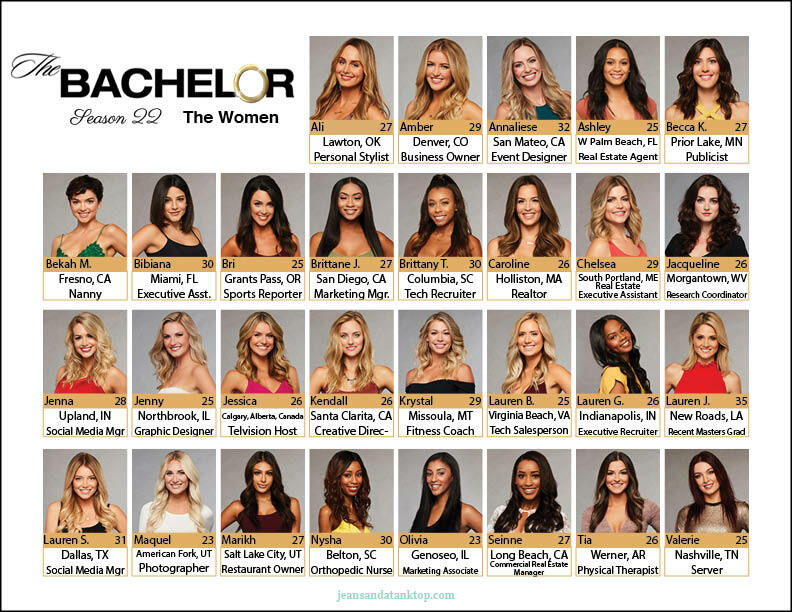 Choose the 18 women that you think will survive the next rose ceremony. Continuing filling out your entire bracket, to completion, PRIOR to watching the second rose ceremony. That’s it! Play along with friends and choose your own reward for the person who ends with the highest points. I will reveal my own completed Bachelor Bracket prior to Episode 2. So far, I’ve correctly picked Kaitlyn, Ben and JoJo’s final picks. I was only off by one gentleman on Rachel‘s season (and let’s be honest, who saw that coming?) Can I finally get back on track? You can either print the bracket and cheat sheet from the image above, or download the Bracket PDF here (which includes instructions) and find the Cheat Sheet PDF here. Throughout this season I’ll also be posting episode recaps, including links to fashion seen on The Bachelor (when I’m able to find it). Want to make sure you never miss a beat? Sign-up for my Bachelor/ette Fans mailing list! If you think that sounds awesome (I sure do), all you gotta do is click! Subscribe just in time for Bachelor Season 22! So who wins the bracket? Lauren or Becca? Nicole, these are the things that keep me up at night. Literally. Apparently we can now coin the phrase “pulling a Jason Mesnick”. Who could have known that would happen twice?